The Vision Craft Center from Studio Designs is just what the organized crafter needs! The two-piece set consists of the Vision Craft Station table and a stool. Constructed of heavy-gauge, powder-coated steel, the Vision Craft Station table is built to provide years of service. 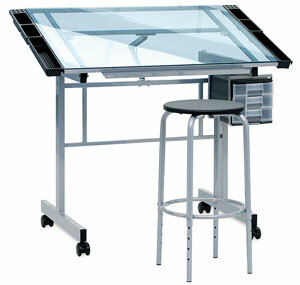 Its work surface is blue tempered safety glass and measures 35½"W × 24"D (90 cm × 61 cm). It tilts up to 70° to suit a variety of crafting activities, has a handy 23¾"W × 2"D (60 cm × 5 cm) storage pencil ledge, and can also be used as a light table. Two removable side trays and three molded plastic slide-out drawers are designed to hold a variety of art and craft supplies. The overall dimensions of the table are 30¾"H × 40"W × 26"D (78 cm × 102 cm × 66 cm). Four casters (two locking) make it easy to move around. The table weighs 37 lb (16.8 kg). The stool adjusts to five different heights from 18¾" to 24¾" (48 cm to 63 cm). It features a powder-coated steel frame, a padded seat, and four non-skid rubber feet. Both items include a 10-year manufacturer's warranty. ™ Studio Designs is a trademark.